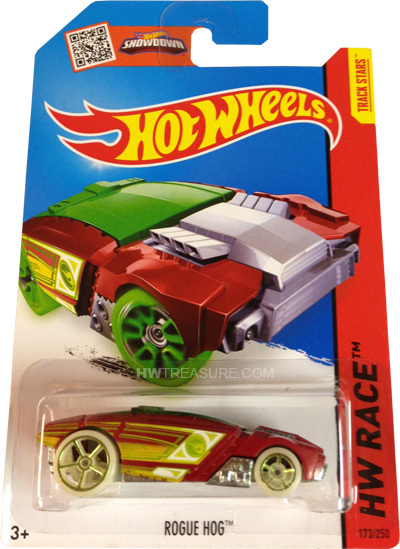 173/250 is part of the HW Race series and the 2015 Treasure Hunt set. 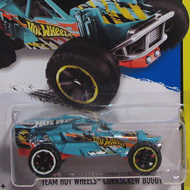 The dark orange car sports white, yellow & lime green striped graphics as well as the Hot wheels logo and the low production symbol on the sides. It has a green tinted window-top, chrome interior, Open-Hole 5-spoke wheels with green chrome rims, and a metal Malaysia base. 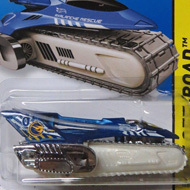 This vehicle can be found in mix “P” of 2015 Hot Wheels mainline cases. The car made its debut in the 2007 New Models series. It is a unique design the features a sleek and futuristic style.